FILE - Afghan security forces respond to a suicide attack in Kabul, Afghanistan, March 1, 2017. The High Peace Council (HPC), a government-funded body tasked with bringing insurgents to negotiations, invited more than 700 religious scholars from all 34 provinces of Afghanistan for a two-day conference in the capital, Kabul, to discuss peace efforts to help end the country's 16-year bloody insurgency. "Taliban should remove all those elements from their ranks and files that have ties with international terrorism and have no respect for Islamic and Afghan values," read a joint declaration released at the end of the conference. "Taliban must respect the aspirations of the Afghan people and join the Afghan-owned and intra-Afghan peace talks," Faizani said. "Whatever their demands are must be discussed peacefully through negotiations. They must immediately cease violence, suicide attacks, explosions and the targeting of innocent civilians." FILE - Afghanistan's President Ashraf Ghani addresses the United Nations General Assembly at the United Nations headquarters, Sept. 19, 2017. "We accept all of it [the demands of the scholars], but I hope that the Taliban also endorses your demands to prove who has the commitment and the intention for peace," Ghani said. "We say we want peace with dignity. We do not want surrender. Rather we insist that we do not have any conditions for the beginning of direct negotiations," Khpalwak said. "If they [Taliban] have any conditions, they should put them on the table." A day after the religious scholars' conference, a suicide attack Thursday at a Shiite Muslim center west of Kabul killed more than 40 people and injured another 80, including women and children. 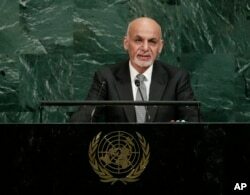 VOA's Afghanistan service contributed to this report.